There was widespread violence in the ward congress of the All Progressives Congress (APC) which held across the country on Saturday. From killings to the outbreak of violence to allegations and counter-allegations on the process being hijacked, the exercise left the party more divided than it was before the ward congress. John Oyegun, national chairman of the party, did not partake in the exercise. While the congress held across the 192 wards in Edo state, Oyegun was not seen in ward 2, Oredo local government where he registered. Oyegun’s non-participation could be as a result of the move to replace him with Adams Oshiomhole, former governor of Edo. At a south-south stakeholders’ meeting which held two weeks ago, the Edo chapter of the APC pledged support for Oshiomhole as Oyegun’s successor. In Rivers, violence began on the eve of the congress. One person was killed when some party supporters broke into the secretariat in Port Harcourt, alleging that Rotimi Amaechi, minister of transportation, had hijacked the process and was plotting to sideline loyalists of Magnus Abe, senator representing Rivers south-east. The aggrieved party members said the leadership of the party conspired with Amaechi to make forms unavailable for some aspirants but the minister dismissed the allegation. “When people said Amaechi has taken their materials, I laugh. Which materials. We did not come back with any material. What we have are forms which are out there for sale. We told interested candidates to go to the bank, pay some amount of money and use their tellers to pick their forms,” Amaechi told reporters. The exercise held amid rancour but Abe said congress did not hold in any of the 344 wards of the 23 local government areas of the state. In a statement, the senator said some leaders of the party “deliberately” want to obstruct the ward, local government and state congresses and appealed for the intervention of the national leadership of the party. In Delta, violence broke out in Ughelli south local government area of the state, resulting in the death of one Jeremiah Oghoveta, a chairmanship aspirant. Oghoveta was reportedly stabbed to death after a heated argument over allegations of hijack of electoral materials. Tete Pippah, the alleged suspect is said to be on the run. The police said that they are already investigating the incident. A faction of the party in Bauchi said to be loyal to Yakubu Dogara, speaker of the house of representatives, alleged that guidelines for the ward congress was not followed. The faction alleged that the party in the state issued a directive that only forms that come through the party office in the state would be valid for the ward election in the state contrary to the national position. “Everybody prepared for the elections. We were fully ready. We paid about N13m to purchase the forms but to our greatest surprise we haven’t got the forms,” Sulieman Nazif, senator representing Bauchi central, told journalists. 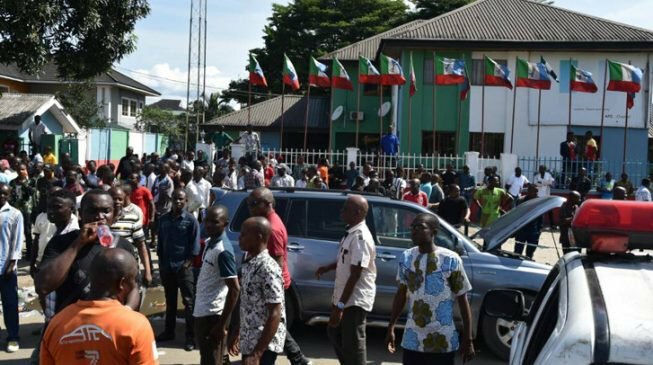 In Imo, some thugs reportedly attacked the party’s secretariat which made APC officials seek refuge at the state’s police command. The thugs were said to have also made away with electoral materials. Despite the violence, the congress reportedly held in some parts of the state. There was also a case of violence in Oyo. Thugs invaded the congress at the party secretariat in Oke-Ado, leaving some people with injuries. After the disruption, party members converged on the secretariat under tight security but Dapo Lam-Adesina, a member of the house of representatives, was allegedly manhandled when he returned to the venue. There were allegations that Abiola Ajimobi, the governor, was behind the attack on the party’s secretariat but he denied it. The congress was later postponed. In Ondo state, the exercise was also marred by irregularities as many members of the party did not participate in the exercise. In Kaduna, the congress did not in some parts of the state. TheCable observed that only few party supporters turned out for the exercise in Kaduna central senatorial district. The situation was not diffferent at Chickun and Kajuru local government areas in Kaduna north and Kaduna south senatorial districts. Some ward chairmen of the party said congress did not hold because officials of the party and the Independent National Electoral Commission (INEC) did not visit their areas. The exercise did not take place in the 12 wards of Kwarau, Turunku, Igabi, Fanshanu, Gwaraji, Zango Aya, Riga chukun, Afaka, Kirawa, Birnin Yero, Rigassa, Sabon Birni, it was only in Riga-Chuckun that party members voted and Umar Rigachukun, chairman of APC Awareness Forum in Riga Chukun, told reporters that only few people turned up for the exercise. He said the person who won the chairmanship position emerged with 25 votes, defeating his closest opponent with 14 votes. Also in 12 wards in Kaduna north and the 13 wards in Kaduna south Local government areas, there was no congress and no official could be reached for comments. Efforts to reached Yahaha Pate, acting state secretary of the party, for comments was unsuccessful as his telephone was out of reach. Shehu Sani, senator representing Kaduna central, could also not be reached on phone. In Kogi, the Audu/Faleke political organisation declared that majority of its candidates won in the congress across the state. In a chat with reporters in Lokoja, Kogi state capital, Hadi Ametuo, chairman of the Faleke faction, said he was glad to announce that APC members came out in their thousands to elect the ward executives across the state, with members of the Audu/Faleke group “running away with victory”. In Katsina, the congress was successful to a large extent. Accompanied by Bello Masari, the governor, President Muhammadu Buhari participated in the ward congress at Bayajjida Model Primary School in Daura, venue of the congress. The president interacted with party members at the venue where he spoke of what made him join politics after forceful retirement from the military. In Lagos, Vice-President Yemi Osinbajo took part in the congress in Eti-Osa local government area, Akinwunmi Ambode, the governor was in Epe for the exercise, while Bola Tinubu, a former governor of the state, participated in the congress in Ikeja. They all lauded the process in the state.